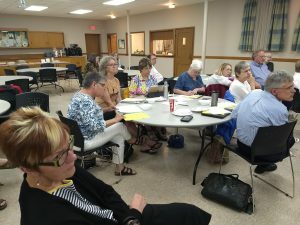 Forty OTOC leaders gathered for the final Summer Training in a Steering Committee to Kick off the house meeting campaign that runs from now until September 16. 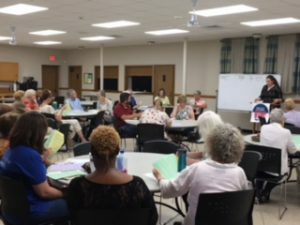 Leaders from over fifteen congregations and solidarity members committed to how many house meetings they will be holding and how many people would attend the house meetings. 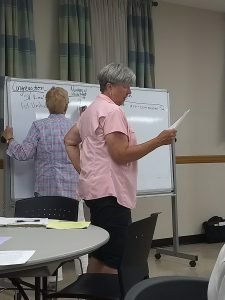 Thanks to the leadership of co-chairs of the meeting Sarita Penka and Richard Blocker, the assembly successfully went through a review about the importance of house meetings, the congregational reports, a finance presentation, and issue team presentations. 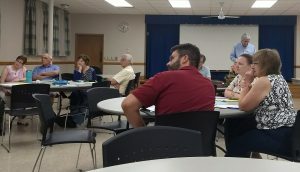 Please remember that house meetings are a time for listening and building relations and those relationships get people to turn out for things like the Candidate Accountability Sessions on September 17th (OPPD and Congress at St. Leo Catholic Church) and October 22 (Nebraska Unicameral at First United Methodist). Start signing people up! 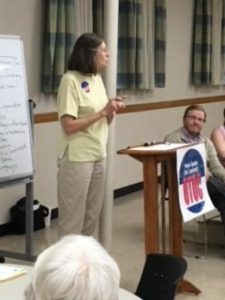 Sixty leaders joined Organizer Liz Hall from our sister organization, AMOS in Iowa, on July 9 for a training about house meetings. Liz reviewed the purpose of house meetings- not only to get to know one another better, but listen for issues and identify new leaders. Then, participants practiced house meetings at their tables. 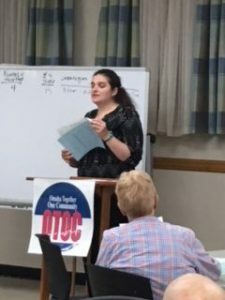 Lastly, Liz went over how to plan listening campaigns (see House-Meeting-Planning-Form) , including thinking about how they will work best for your congregation or group. 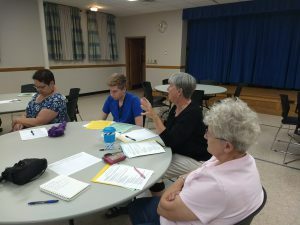 House Meeting 1 Training: Why Have House Meetings? 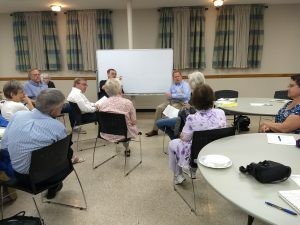 On a very stormy Monday evening in June, twenty-five leaders braved the weather and met to learn about house meetings. 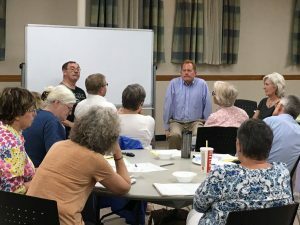 Paul Turner of the national IAF staff joined us to talk about why having house meetings are important and what we can get from them. A house meeting is a small group meeting where people share what pressures they are facing. 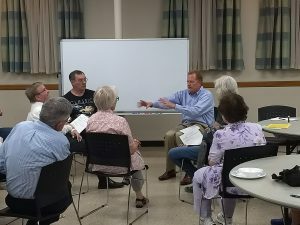 But the true goal of a meeting is not to just identify issues that the community faces, but to identify the people experiencing those issues. 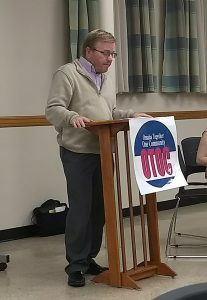 OTOC aims to train people how to have a voice on issues that matter to them, and house meetings help us identify leaders who are motivated to make change for their community. Click these links for more info about Relational Culture by Paul Turner and the importance of having a voice. 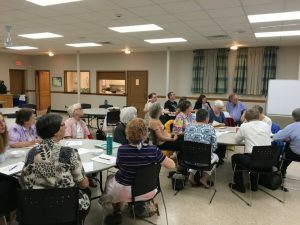 People who attended the meeting were also able to watch a house meeting and then practice themselves. The crowd was excited to learn more and use this skill as a relationship building tool going forward. 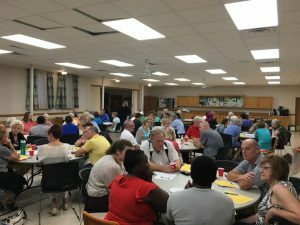 OTOC will be having a listening campaign starting in August where churches across the city will have house meetings to identify interesting leaders, identify new issues, and form better relationships in our communities. For notes about what house meetings are, click here. 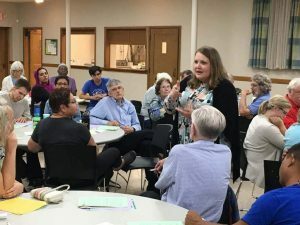 The next house meeting training will be on July 9 at 7 pm at Augustana Lutheran Church (3647 Lafayette) and will focus on how to set up a house meeting campaign and what we need to do to prepare for our listening campaign this fall. 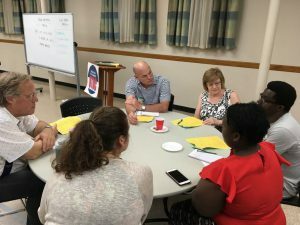 To start preparing your congregations campaign, begin thinking about who could lead a house meeting campaign in your congregation, who could host a meeting and get people to turn out, how many people you would like to reach, and who you want to be invited. 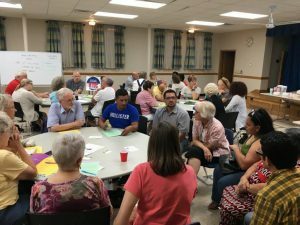 The listening campaign will kick off on August 13 at 7 pm at Augustana Lutheran Church (3647 Lafayette) during an OTOC Steering Committee where we will make commitments about listening campaigns in or churches and parishes. For a flyer of these events and what we are leading up to in the fall, click here.